Bachelorette parties are always a lot of fun! It’s a time to celebrate an upcoming marriage for a special friend or family member. 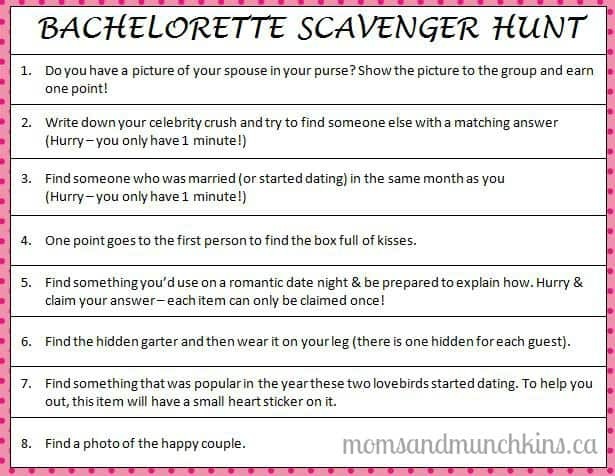 Here is a free printable Bachelorette Scavenger Hunt game that’s suitable for all guests. Click here for the free printable. The host of the game will have the free printable and will ask the questions to the group. Provide each guest with a piece of paper and a pen. As you ask each question, the guests will have to quickly search for the item you’ve asked for. If they successfully complete the task in the time provided, they can mark down one point for themselves. Do you have a picture of your spouse in your purse? Show the picture to the group and earn one point! You could also say the first person to show the picture earns a point. Write down your celebrity crush and try to find someone else with a matching answer. First ask guests to write down their celebrity crush. Once that step is complete, then ask them to find someone else with the same answer. Give guests one minute to successfully complete this task. Find someone who was married (or started dating) in the same month as you. Give guests one minute to complete this task. One point goes to the first person to find the box full of kisses. Hide a small box of Hershey’s Kisses somewhere in the party area. The first person to find the box wins the box of chocolates and 1 point! Find something you’d use on a romantic date night & be prepared to explain how. Hurry & claim your answer – each item can only be claimed once! Since each item in the room can only be used by one guest, you are sure to have some guests choosing some interesting items with funny explanations. Find the hidden garter and then wear it on your leg (there is one hidden for each guest). Hide one garter per guest at the party. You can find these at your local dollar store, craft store or party store. Find something that was popular in the year these two lovebirds started dating. To help you out, this item will have a small heart sticker on it. This could be something like a trendy piece of clothing that was in style that year, a CD of a popular group or song, a DVD of a movie made in that year, etc. Find a photo of the happy couple. You could hide this in an unlikely area like on the fridge or on the back of a picture frame. If the guests are having troubles finding anything on the Bachelorette Scavenger Hunt, you could always start playing Hot or Cold to help them out. If they are close to the hidden item, they are HOT. The further away they get from it, the COLDER they are. What’s your favorite part of a bachelorette party? Have you ever played a Bachelorette Scavenger Hunt? Stay updated on the latest fun ideas by following us on Facebook, Twitter, Pinterest and Bloglovin’. Oh That is such a great idea! Scavenger hunt games are so much fun. These is an awesome game, I will definitely be bookmarking this for friends and family. Awesome! Wouldn’t this be a fun party!? You have the best ideas on your blog. I love this! I am really enjoying all your ideas and activities on your blog! I’ll keep this one handy for the next time I have to throw a bachelorette!